Great Neck Plaza, NY Mojo Stumer Associates has completed the design of two Long Island projects. The first project was the Maple Drive Apartments for Spiegel Associates in Great Neck Plaza. The 30-unit mixed-use multifamily building at the entrance to an incorporated village was designed to be a feature of modern form and detailing, while still adhering to the standards of proportion and scale of its immediate context. With a restrictive site of limited area, the goal of the site and massing design was to form the building in a manner that would maximize sidewalk area and retail exposure, while also provide the necessary depth for unit floor plans above. To achieve this, a slight inward taper was introduced to the footprint of the first floor, while the stories above carried ac ross parallel to the road. This formed an angular setback at the first floor retail, with covered retail frontage, creating a simple yet sleek massing to occupy the corner intersection. Narrow-format brick clads the majority of the structure, broken only by continuous linear bands of windows, intended to bring abundant levels of daylight into the living units. Tapered metal frame enclosures project from these ribbons to maximize light and views in public spaces within, while vertical wood slats infill the fenestration at more private functions providing subtle light. The apartment lobby entrance is highlighted by a cantilevered wood slat overhang which wraps continuously up the four-story vertical curtain wall cut into the otherwise solid form. The wood slats carry across the recessed penthouse as cladding, breaking to reveal black steel frame window walls accessing the hidden roof deck. 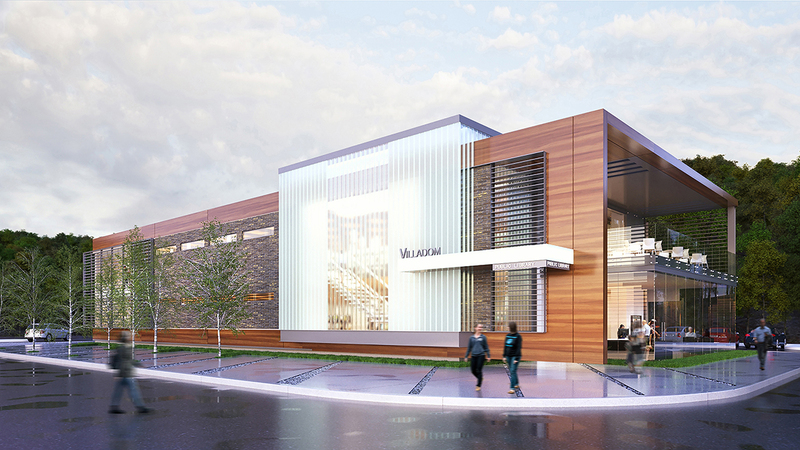 Planned as the feature cultural component to a large mixed-use development proposed in Elwood, the Villadom Library was designed as both a centerpiece for the new community center and a transitionary element to carry visitors into the newly developed site. The building was oriented as a linear massing aligned north-to-south as a way to define the line of primary access and facilitate movement into the complex. A planted pedestrian plaza lines this main thoroughfare which acts as a direct and permeant connection between the community and its new feature development. A drop-off area is tucked away at the south extent of the building, off the main entry road, where primary views from the narrow end of the massing are oriented toward the adjacent nature preserve. The building’s facade highlights the long and narrow orientation of its massing. 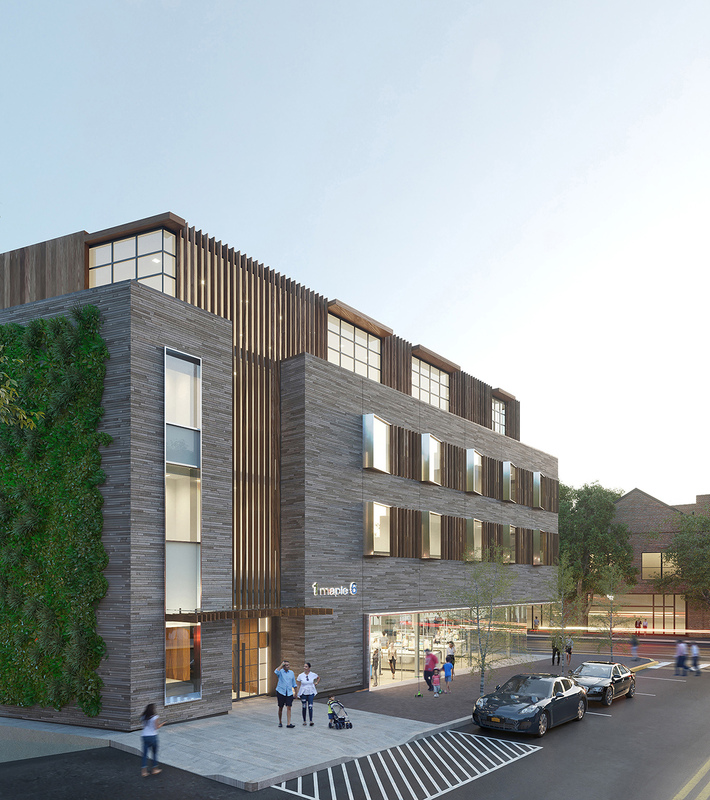 Wood façade panels express a deep and characteristic horizontal grain, with a central inlay of dark panelized brick and overlapping horizontal aluminum louvers on either end, all floating slightly above the planted grade below. This floating façade assembly extends past the building’s enclosure at the south to further accentuate the linear nature of the design, and cuts away at the north to reveal a double-height curtain wall showcasing a public space within. Other fenestration is carefully located to respond to programming on the interior. Narrow high windows are located along stacks and private reading rooms to maximize daylight while maintaining a more private interior setting, and larger expanses of full height glazing are situated at gathering spaces. Offset from center of this dynamic linear façade wall is an internally lit double-height cube of channel glass, where two levels of transparency are balanced to reveal and highlight a central staircase within. The wood, brick, and metal of the primary façade carry directly into and through this glowing glass cube, again emphasizing the linear nature of the building’s form.